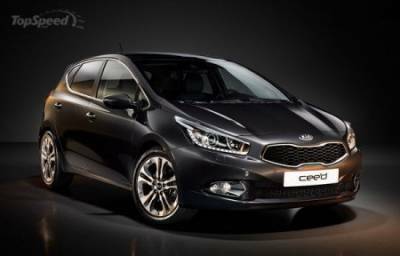 The history of car Kia C'eed begins six years ago with a car show in Geneva, and, like any story, she begins to develop in a spiral: the company is now introducing a new model at the same exhibition. Car exhibition in Geneva in 2012 will be a springboard to showcase a new generation of the popular car. The new model will be longer, wider and lower than its predecessor, showing a more dynamic and sophisticated design. Decorate the front of the car brand new company - grill "tiger nose" aggressive headlights with LEDs. Complete the creation of a new way rear spoiler. As for the car, it will create an impression of "premium" as the type and the feelings, revealing a completely new quality, ergonomics and comfort. The instrument panel gets a new scheme, all the control options will be made ​​on the wheel and the seats and panels will be finished with high quality materials.